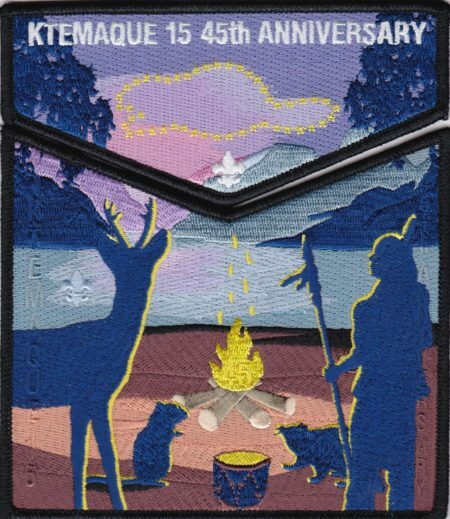 I had previously written about a new 45th Anniversary Flap from Ho-Nan-Ne-Ho-Ont Lodge #165, it had a multicolored border with a white base material. There was a separate flap issued for I believe for a $1,000 SME/FOS donation. However youth in the Lodge could earn if through service. They shared the same design, but this version has an SMY base in the border. Here is the image of the White base border. Ho-Nan-Ne-Ho-Ont Lodge #165 has issued two flaps for its 45th Anniversary with a ghosted 165 on the left hand side of the flap. Anyone have an image of the other flap?